I love to help people. I have given my time and effort to community service projects because I believe that if we are fortunate enough we should be generous to others. Below are a few of the community service projects I have done. Sign up for the "I Can Be" Newsletter to learn about future events and how you can help! I collected over 100 toys for Kosair Charities and was made a member of their Kids Club for young givers. I collected over 500 food items and fed 20 kids in the Dare to Care Food Bank Backpack Buddy Program. 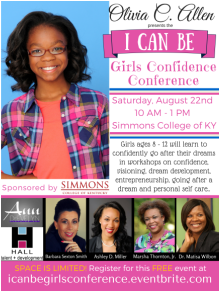 I started a girls conference to teach girls ages 8 -12 about being confident and going after their dreams. Olivia is represented by her mother, Anitra Durand Allen.